Just ahead of the holiday quarter, shares of both GoPro and FitBit have stumbled, with the former’s stock falling 5.02% as it gets ready to report its third-quarter earnings after the bell, while the latter’s share price crashing 30.6% after Wall Street analysts cut their ratings and pointed to uncertainty about future demand for its fitness bands, Reuters is reporting. The shares of both companies soared following their IPOs in 2014 and 2015 on a wave of optimism about personal electronic gadgets and “wearable” technology, only to tumble in the past year with signs that demand for their products might be peaking and facing tougher competition. While Fitbit’s colorful fitness-tracking wristbands have little to do with GoPro’s action cameras favored by surfers and skiers, both Silicon Valley companies attracted investors betting their electronics products would become major hits with consumers. Fitbit’s stock traded recently at $8.86, or less than half its initial-public-offering price of $20. 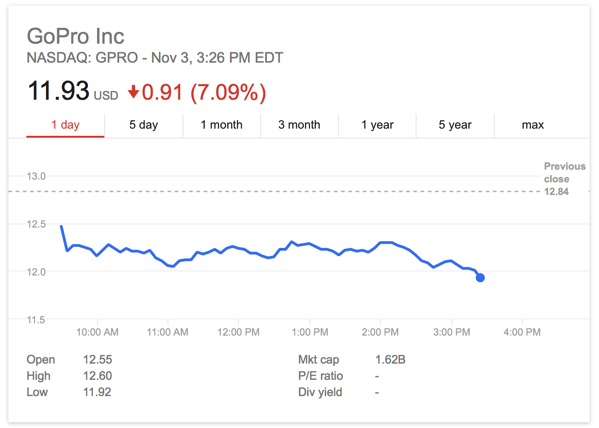 Similarly, GoPro were trading at $12.32, which is just a little more than half its IPO price of $24. Overall, shares of GoPro have lost 32% in 2016 while Fitbit is down 70%. “They’re trading vehicles for the most part. You wouldn’t put your grandmother in either of these stocks to hold for the next 10 years,” said Longbow Research analyst Joe Wittine, who has a “hold” rating on GoPro. GoPro has recently launched a new camera, the Hero5, as well as its first consumer drone, the Karma, which is why the investors are now focusing on their reception among consumers over the upcoming holiday shopping season.